Propolis is a resin-like substance which is synthesized by bees from the poplar buds and cone-bearing trees. Propolis is obtained from beehives as bees use Propolis to build their hives. So, finding Propolis in pure form is extremely rare. To find the answer to the question, what is Propolis, scientists have researched the chemical composition of Propolis. It contains over 300 natural compounds like phenolic aldehydes, amino acids, polyphenols, quinines, coumarins, and steroids. Raw Propolis is made p of nearly 50 percent resins, 30 percent waxes, 10 percent essential oils, and the rest 5 percent of various organic compounds. The composition of Propolis depends upon the collection time, location and plant sources. Propolis contains polyphenols known as flavonoids. Flavonoids are produced in plants for protection against external elements. They are also found in foods which have antioxidant properties such as fruits, green tea, vegetables, and red wine. Propolis can be purchased from pharmacies or even health food stores. Propolis has anti-inflammatory effects and healing properties. Propolis ointment or cream is applied externally as it has antimicrobial, anti-inflammatory and antipruritic effect. Propolis ointment also increases the regeneration of damaged tissues and metabolic processes. Propolis has many medical benefits which are not fully known to everyone. Studies have shown that taking propolis by mouth on a regular basis reduces canker sore outbreaks. It also helps improving healing time and reduces pain from cold sores when used in ointment form. Propolis Ointment improves the healing of lesions in case of genital herpes. It helps in healing lesions rapidly. Application of Propolis ointment helps in treating minor burns. Bee propolis has been useful for honey bees and humans for hundreds of years. Honeybees use it to keep their hives intact and free from attack while human beings use bee propolis internally and externally for various medicinal purposes. Bee propolis is a resinous mixture produced by honey bees by a combination of their saliva and beeswax with other substances collected from tree buds, sap flows and other plant sources. The color of the Propolis may vary depending on the source used by the honey bee. The usual color of bee propolis is a dark brown. Propolis is used by honey bees to seal cracks and gaps in the beehive so that it is safe from snakes and lizards. People take in bee propolis when they consume honey. But if someone has an allergy to honey or bees, they will also react to bee Propolis related products. Prolonged use of Bee Propolis may cause an allergic reaction to itself. Bee propolis can be safely ingested in the forms of liquid extract, capsules, tablet or powder. In case of mouth related issue such as a sore throat, propolis spray is very useful. 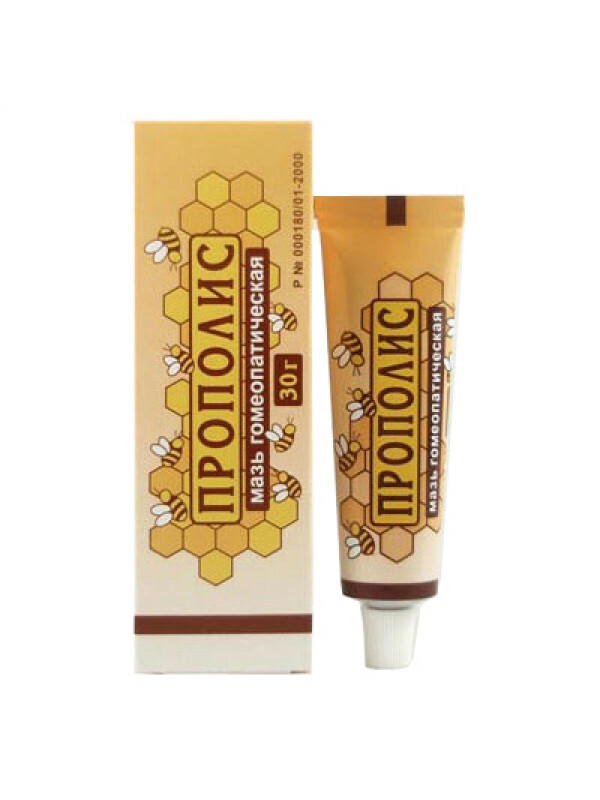 Bee propolis is used externally by applying propolis ointment or cream. The recommended internal dose of bee propolis is nearly 500 milligrams on a daily basis. It fights against infections caused by various microorganisms such as intestinal infection known as giardiasis which is contracted from infected people, or by eating contaminated food or drinking water. It provides relief from minor burns. Rinsing mouth with propolis daily improves healing and reduce pain and swelling post mouth surgery. It helps in alleviating painful mouth sores and inflammation caused by chemotherapy. It can prevent oral thrush in people with dentures. It also protects against upper respiratory tract infections. Propolis might also help prevent or reduce the common colds and infections in upper respiratory tract infections. Benefits of Propolis include relief from vaginal swelling and warts. Benefits of Bee propolis includes anti-tumoral and anticancer effects. Hundreds of scientific studies and articles have shown a positive effect of propolis for cancer treatment. Two polyphenols in bee propolis have strong anti-tumor agents. Propolis supplements can improve the condition of women with infertility and mild endometriosis. Studies have shown that taking bee propolis, when consumed 500 milligrams twice a day, for over six months increased the pregnancy rate to 60 percent. Propolis can also benefit infertile women without the problem of endometriosis. Antibiotic resistance can increase with the overuse of antibiotic medication with time. Propolis has powerful antibiotic properties which can act as an effective agent against bacteria. Propolis can also help fight against diabetes in adults and children. This can help remove life-long treatment measures like insulin injections and pharmaceutical medications. Propolis may inhibit enzymes that increase blood sugar. It also has antioxidant compounds responsible for blood sugar-stabilization. Propolis can fight yeast infections by reducing the growth of yeast and fungus. Propolis can stop the formation of yeast clusters that cling to body surfaces and hence prevents an infection. If you are wondering, how Propolis is used, the answer is that Propolis is used in making various creams, ointments, and lotions. Propolis can be taken orally in forms of tablet, liquid extract, and capsules. Propolis uses include improving immune response, fighting infections, inflammation, nose and throat cancer, healing stomach and intestinal disorders, tuberculosis, ulcers, and wounds.